Alliance, NE – July 2011: Large diameter tires and hydraulic-assist steering can play havoc on Wrangler JK models if the front track bar and steering box are not reinforced. The factory track bar mount on the chassis is particularly vulnerable to extreme forces. Crank on the steering wheel too hard and you risk tearing the OE mount completely off of the frame. Unfortunately, the output shaft on the steering box is even more troublesome. 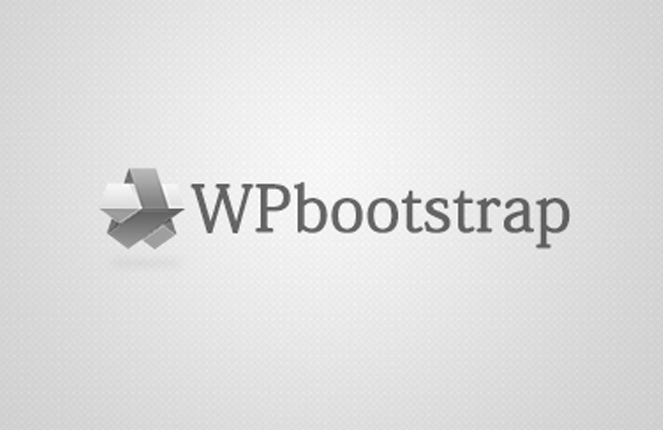 The internal support bearings are poorly positioned and notorious for wearing out very quickly. Some indicators include a noticeable “clunk” noise and excessive play in the steering wheel. And since the OE steering box is not serviceable, the only option is to replace the entire assembly. JKS Manufacturing has developed a system of three interlocking components that eliminates these problems while actually improving drivability and performance. 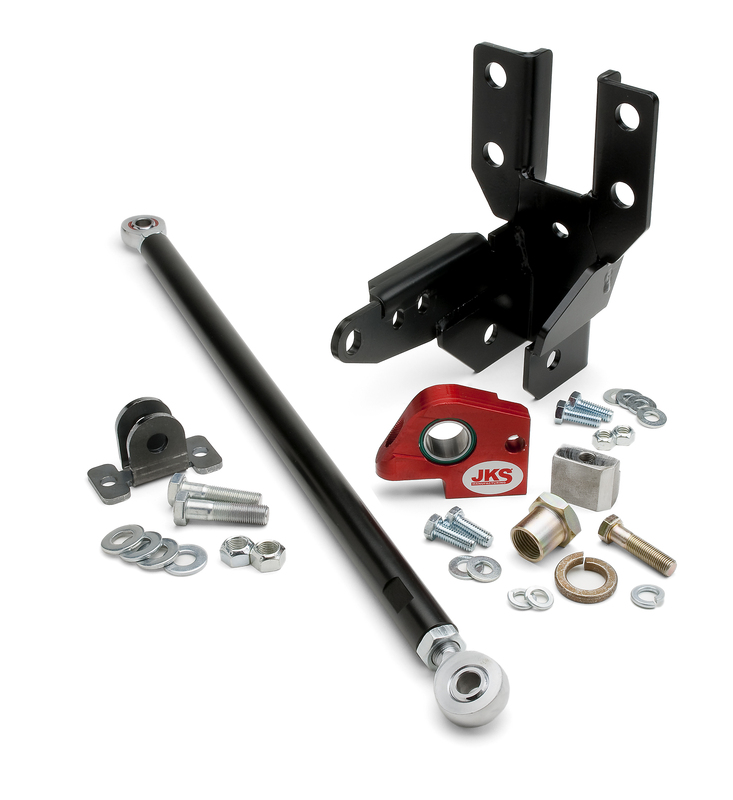 The Front Trackbar + Sector Shaft Reinforcement Kit dramatically increases the strength and load capacity of the front track bar mount. It also adds a heavy-duty bearing fixture to stabilize and support the steering box output shaft. This ingenious kit can easily save the JK owner thousands of dollars in steering box replacements and track bar mount repairs. 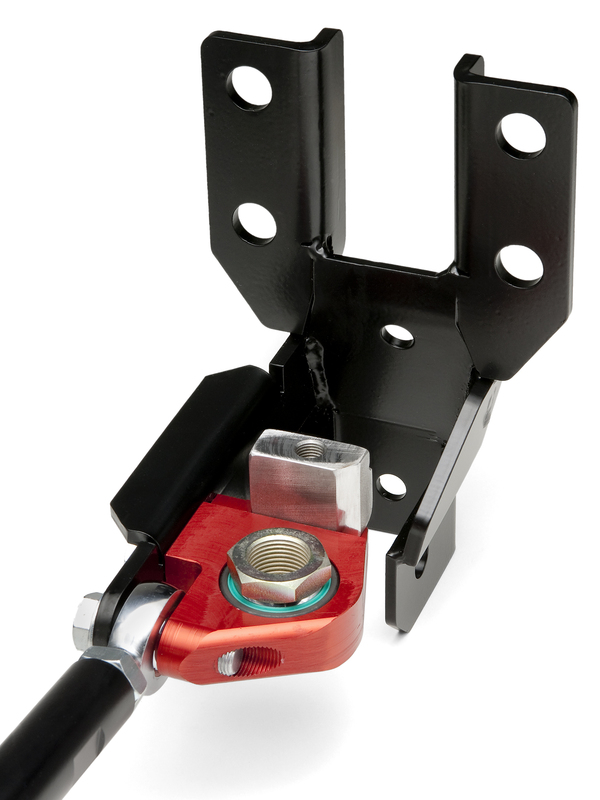 The core component is a heavy-duty reinforcement bracket that fits over the factory track bar mount and connects it to the chassis at eight additional points. This makes the upper track bar mount rock solid and strong enough to withstand any amount of punishment. 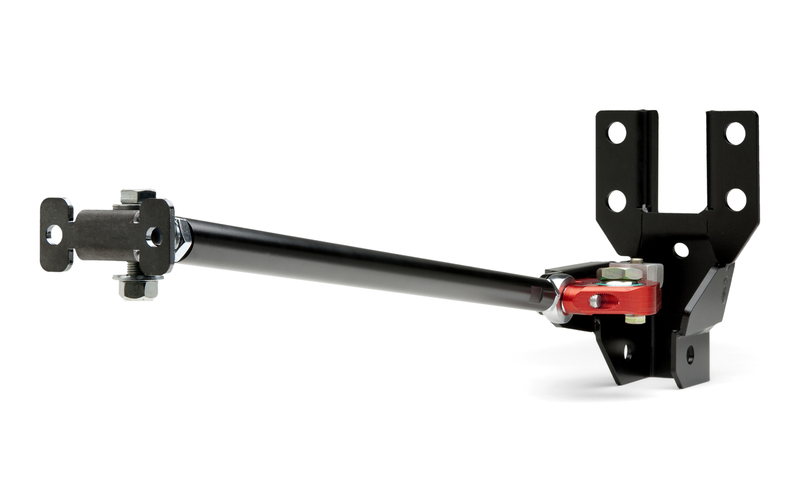 Also included in the kit is a tubular support strut that connects the left and right chassis rails using flexible mounting points. This unitizes the front chassis structure and distributes chassis loads more evenly between the left and right frame rails. The final component keeps the sector shaft stabilized within the steering box by adding an additional support bearing at the bottom. As a result, the shaft remains concentric within the steering box at all times and steering input is transferred to the wheels more efficiently. This alone can extend the life of the steering box dramatically.